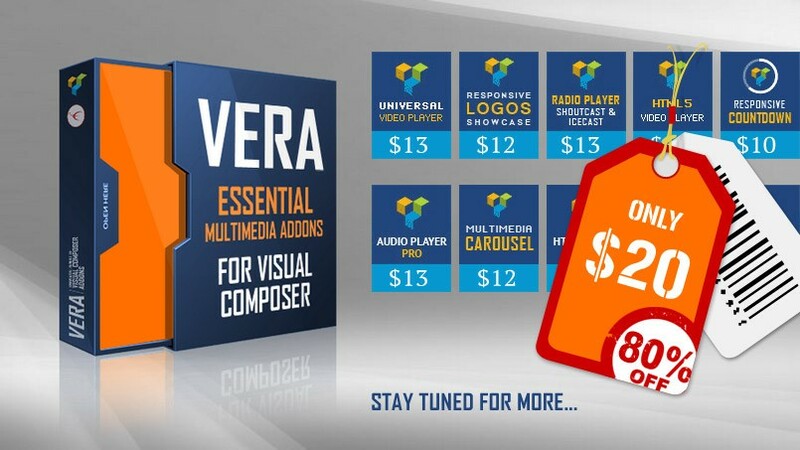 Visual Composer Addons Bundle – VERA brings together multiple responsive plugins including audio, radio and video players, logo showcases, multimedia carousel, that will make your WordPress application sing! Once you purchase this visual composer addons bundle, you regularly receive free updates. And more than this, you will not have to pay anything for the new products that we will add to the package. We constantly include new addons. You will be able to download the new ones as well, directly from your account. Each addon is a complex product and full of options. Yet, they are easy to use and customize. To accomplish this we put a lot of effort into their development. We try to keep the installation, interface, customization steps as similar as possible from one addon to another. This is meant to make your life easier, and enable you to effectively focus on design rather than interface. This offer is like subscribing to new software. You buy once and get a license for every new component we add. It’s not generosity, though generosity is a good thing. This is an open business plan: when you get to use our products we are confident you will like them, return for more and even tell your friends about it. If you already know about this – you can skip this presentation and hurry to buy it now! All visual composer addons – those included and those to be included in this bundle – have detailed video tutorials, that show how to install and setup. Our team ensures that the products are constantly updated, according to the latest available technologies and the newest version of Visual Composer. You will download a product that contains almost all the necessary components of a website. We’ve created a YouTube playlist containing all the video tutorials: https://www.youtube.com/playlist?list=PLFPbDjKXBeqbA7vXvDutUUtI4g6JFQCm- Also, on each plugin page you’ll find the associated video tutorial. If you need additional information don’t hesitate to contact us at [email protected]. We’ll try to answer you as quickly as possible. Enjoy!